Cross Match Order cross match if there is a1 in10 chance of giving blood, and ask the lab to put the blood on hold. Uncrossmatched Blood Order if you need stat blood. Call the lab and communicate that you need unmatched O- or O+ blood stat. O-: females of child bearing age, or known Rh- patient. O- blood prevents alloimmunization that could affect future pregnancies. If active bleeding, how brisk is the bleeding? In non-urgent, non-bleeding patients, transfuse 1 unit at a time, repeat exam to reassess the need for further units. 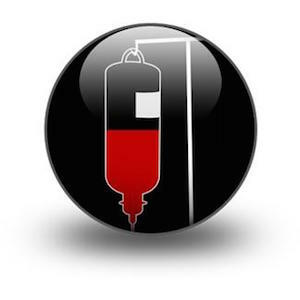 Duration of transfusion: slowly, up to 4 hours per transfusion. Furosemide to prevent TACO: To prevent transfusion associated circulatory overload (TACO) consider IV furosemide prior to the start of transfusion in patients at high risk for TACO (see below). For patients at lower risk for TACO, po furosemide may be adequate. TRALI is non-cardiogenic pulmonary edema, with onset within 6h of transfusion. 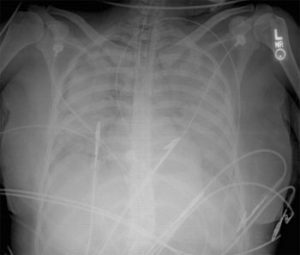 Findings include SOB, hypoxia, diffuse bilateral infiltrates on CXR. Dx clue: TRALI does not respond to furosemide. Treatment: stop the transfusion, disconnect tubing, supplemental 02, ventilatory support prn. Transfusion Related Graft vs. Host Disease (GVHD) Rare, high mortality. Can damage liver, skin, mucosa, GI tract causing diarrhea. Preventable by using irradiated blood in at-risk immunosuppressed patients (including patients with bone marrow transplant, leukemia/lymphoma, hodgkins, immunodeficiency state, use of certain medications, sickle cell patients). For all immunocompromised patients speak to your transfusion technologist regarding special requirements for blood (i.e. irradiated blood). For the latest on Infection Risk in Transfusions see Ryan Radecki’s analysis of a JAMA meta-analysis on the subject from May 2014. Stable patients with a chronic GI bleed of small volume can tolerate low hemoglobins. Upper GI bleeds are associated with worse outcomes when transfused liberally (see below – increased bleeding, higher mortality, increased length of stay). NJEM (2013) Study: patients with upper GI bleeds randomized to a restricted transfusion group (transfused for Hb < 70, goal 70-90) had better outcomes (lower mortality, less bleeding, less cardiac events, decreased need for surgery) versus the liberally transfusion group (transfused for Hb <90, goal 90-110). Note: this study was in a highly controlled environment with rapid access to GI scopes, therefore, may not applicable to all clinical settings. American Association of Blood Bank (2012) recommends transfusion in CAD patients with Hb < 80 and symptomatic. Our experts recommend maintaining NSTEMI patients with a Hb > 80, STEMI patients with a Hb >90 and possibly higher. Is there any evidence of active bleed? Chronic anticoagulation is associated with 1-3% rate of major bleeds (ICH, GI bleed, spinal epidural hematoma, retroperitoneal hematoma, compartment symptoms), and a 6-10% rate of minor bleeds. With a change in warfarin dose, it takes 48 hours for the INR to reflect the dose. 1) Reverse INR to therapeutic level. Avoid reversing the INR to a subtherapeutic level so that prevention of thrombosis is maintained. Give small dose of oral vitamin K (e.g.1 mg po vitamin K). Remember elevated INR secondary to liver disease is treated differently than elevated INR secondary to vitamin K antagonists. Classic teaching is that a bleeding patient with INR >1.5 requires plasma. However, our experts advise caution against this, except in massively bleeding patients. IV Vitamin K usually required as PO Vitamin K will take 1-2 days to work. Dr. Helman, Dr. Himmel, Dr. Pavenski and Dr. Callum have no conflicts of interest to declare.